Length: 4 hrs. 1 min. Only God could weave a story that would captivate people all over the world, bring thousands of people from 17 countries to a free-throw line, raise over a million dollars in international AIDS relief, and build a school and medical clinic in Zambia. And only God could do it through the hands of a nine-year-old boy. Austin made a difference by shooting hoops. 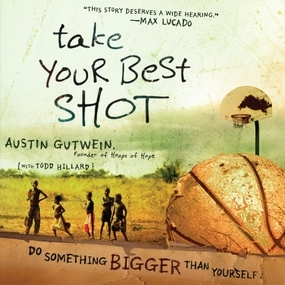 Take Your Best Shot captures Austin’s amazing adventure and challenges listeners that no matter where you are, no matter what your skills are, no matter what your age, you can make a difference! You can do something bigger than yourself.